At 12 years old, Raphael is a strong up-and-comer in the CCF program. Though completely new to cycling, he enrolled in the track program November 2010 and quickly grew to love it. "I played soccer before this," says Rafael. "I was used to just running, and there's so much more to cycling. That's what's so cool about it." His mother, Carina, is thrilled a the changes she has seen in her son. "He was so shy, especially in school," she says. "when he's on the bike, it doesn't matter - the shyness disappears." She says she's happy to have him involved in a sport he loves. "I've seen him become very disciplined, very focused. He's the one hounding me about getting to practice on time." Carina adds that the sense of community surrounding the program has been refreshing. "it's a very healthy environment, great to have him socializing and being active with the team." 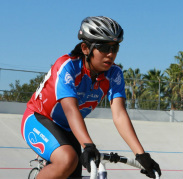 Rafael experienced his first big race at the California Junior State Championships at the Encino Velodrome last summer. "it was challenging, I really learned a lot," he says about the race. "But it was so much fun. I'm ready and eager for more races." Read The story of "Carl"